Do you want a garden that’s easy to install, looks good year-round, requires little maintenance, and helps prevent water pollution? 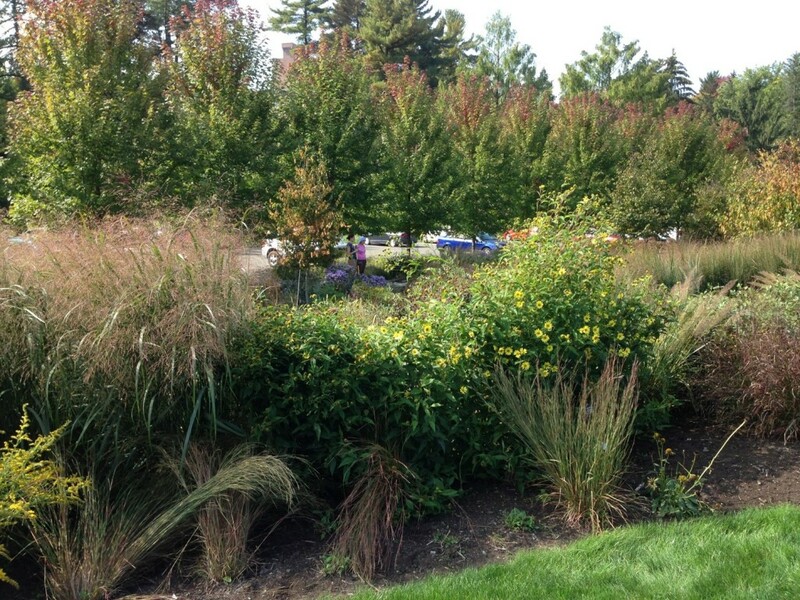 Rain gardens are shallow depressions designed to soak up water and support trees, shrubs, and flowers that tolerate both wet and dry conditions. Often located near gutter downspouts or places where water puddles, rain gardens can also be landscaped into gentle slopes or run curbside along streets. 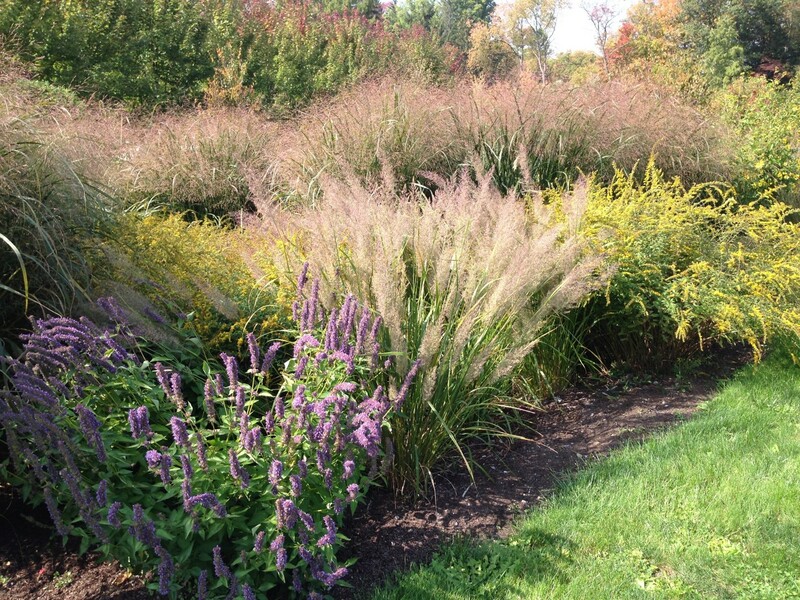 Giant hyssops, switchgrass, and goldenrod grow in this rain garden at Cornell Plantations in Ithaca, planted next to a parking lot to absorb and clean storm-water runoff. Photo © Robin Simmen. By absorbing the rain falling on your land, a rain garden can help reduce the storm-water runoff that pollutes our beaches, harbors, and estuaries. People sometimes confuse rain and water gardens. A rain garden is not a pond and won’t breed mosquitoes, which require 10 to 14 days in standing water to develop from eggs into adults. The next time it rains, observe the direction of water runoff and where it collects on your property. Your roof may be directing most of the rain falling on it into gutters and downspouts feeding into a storm drain; if so, consider diverting this lost rainwater to irrigate a rain garden via underground piping, or construct a surface swale to channel this water to the garden. If your land slopes gently, you can create shallow terraces (one foot deep or less) for your rain garden or dig out a scallop-shaped bed for it in the hill. 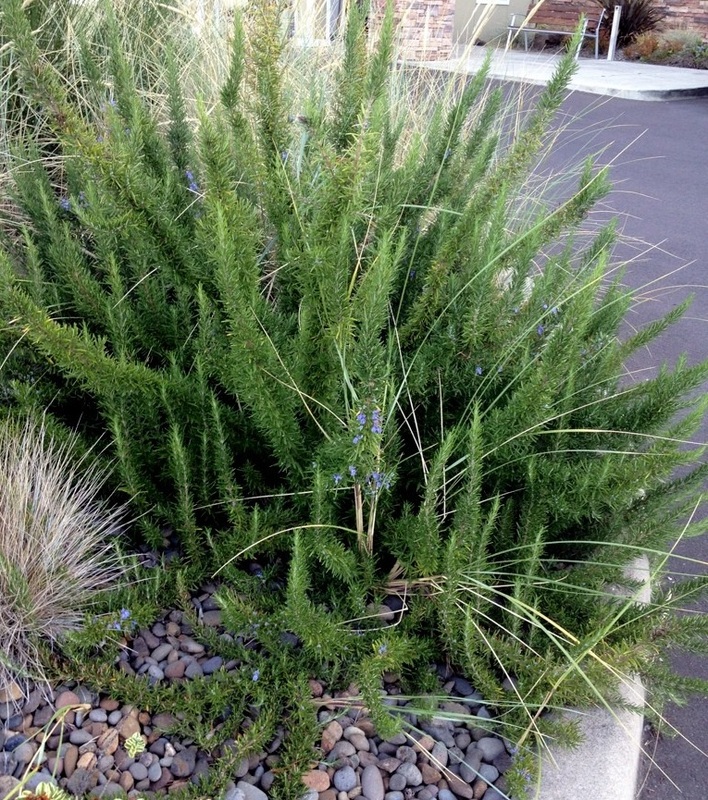 The best plants for rain gardens are happy with a “drought and drench” lifestyle. Native plants are highly recommended because they are uniquely adapted to local weather fluctuations. Also, they require little or no fertilizer, are excellent food sources for pollinators, and provide habitat for birds, insects, and butterflies. Once established, their deep roots increase the water-holding capacity of the soil, hold it together, and prevent erosion. Water a rain garden as needed for the first year or so after planting. By the third year, you’ll never need to water it again! 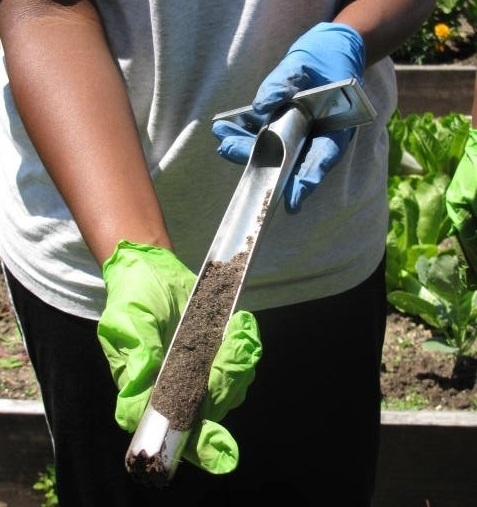 For information on how to evaluate and amend your soil for a rain garden, do a percolation test to see how quickly water is absorbed, decide the dimensions of a rain garden, and prepare and plant the site, read the CCE Suffolk fact sheet on Creating a Rain Garden, and its companion Native Plants for Long Island Rain Gardens. Robin Simmen is a former Community Horticulture Specialist for CCE Suffolk. She can be reached at rlsimmen@gmail.com. This entry was posted in Long Island gardening, Native plants, Sustainable landscapes, Waterwise gardening, Wildlife habitat and tagged bees, CCE Suffolk, Cornell Plantations, diverting lost rainwater, drought and drench plants, fertilizers, insect habitat, irrigation, Long Island gardening, low-maintenance gardens, mosquitoes, percolation test, pollinator gardens, rain gardens, rainfall, soil quality, storm-water runoff, swales on December 13, 2016 by Robin Simmen. Now that the holidays are behind us, decisions must be made regarding the plants we used to decorate our homes or received as gifts. Poinsettias, amaryllis, Christmas cactus, and cyclamen are traditional holiday flowers. Some are quite easy to keep as houseplants and will flower again if given the right conditions. Others are a bit more challenging; maybe it’s best to toss them onto the compost pile after flowering. You be the judge. Christmas cacti are easy to grow and force into flower year after year. Photo © Alice Raimondo. Perhaps the simplest to care for is the Christmas cactus. Many of these cacti are actually hybrids, called Zygocactus, and are not true Christmas cacti which belongs to another genus. In any case, the Christmas cactus can be forced to flower anytime from Thanksgiving through Christmas, provided that starting in September you withhold water from it and it experiences 13-hour nights and cool temperatures in the 55-60 degree range. This is fairly easy to accomplish as this is what normally happens outdoors. Begin by putting the plant outside in late May in a shaded location, water it once a week or so, and fertilize it every other week with a water-soluble fertilizer. Move your Christmas cactus back into the house in late October when the threat of frost occurs. By then these plants are usually full of flower buds. To prevent bud drop, keep your plant in a cool room until the first flowers open; after that you may place it anywhere to enjoy. 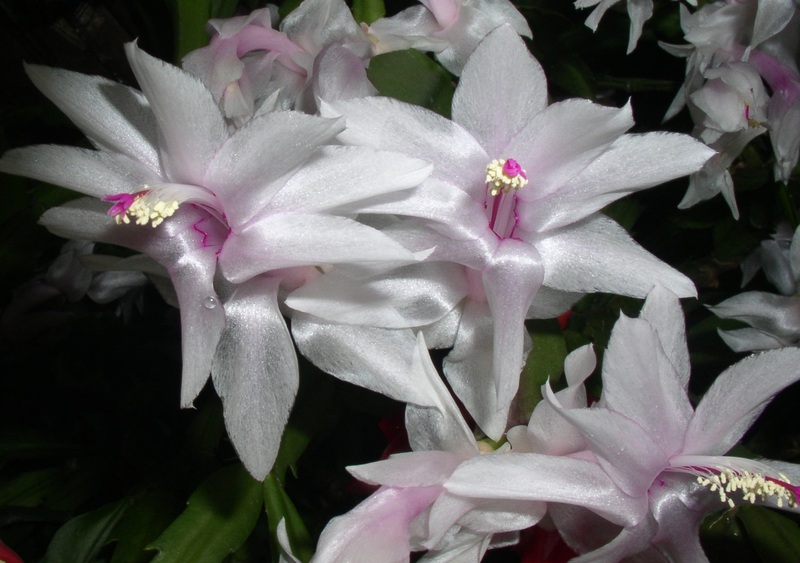 Once it has finished flowering, water your Christmas cactus lightly and give it bright but indirect sun. Be careful not to over water as it will rot if watered too heavily. Another really easy plant to care for is the amaryllis. After it flowers, simply cut off the flowering stalk when it yellows, and keep the bulb watered and in a sunny or bright location. Amaryllis leaves are produced either after or along with its flowers. These leaves need to stay healthy and growing throughout the winter, spring, and summer; they nourish the bulb so it can bloom again. Like the Christmas cactus, amaryllis enjoys summer vacation outdoors in a sunny location. Water your plant a few times a week as needed, and fertilize it every other week or use a slow release fertilizer on the soil surface. In September it is time to stop watering your amaryllis. I find the easiest way to do this is to move the plant into a garage and simply forget about it. This treatment forces the bulb into dormancy, a rest period during which the leaves dry up. After about ten weeks, the pot can be brought indoors and placed in a bright location. Give it a light drink of water and then hold off watering again until you see the flower bud start to emerge from the bulb. Amaryllis bulbs can be kept alive for years this way, and their flowers are very rewarding. Poinsettias and cyclamen are a bit more challenging, so typically I don’t keep them from year to year. Poinsettias often are host to whiteflies, and cyclamen often suffer from corm rot or weak growth. Rarely do either of these plants put on the same flower show if saved as they do when they were originally purchased. Having worked at a greenhouse for several years, I can honestly say that maintaining healthy poinsettias and cyclamen is best left to the grower unless you have lots of space in your home and lots of time on your hands. That said, care information for both plants as well as for Christmas cactus and amaryllis can be found in the following fact sheets: Care of Holiday Plants and Forcing Bulbs for Indoor Bloom. This entry was posted in Horticulture Diagnostic Lab, Indoor plants, Insect pests and tagged amaryllis, bulbs, Christmas cactus, cyclamen, dormancy, fertilizers, holiday plants, Horticulture Diagnostic Lab, houseplants, poinsettias, whiteflies, Zygocactus on January 22, 2016 by Robin Simmen.